Back to the story of the leaf bags down at the Garland Community Garden . . . I've gotten quite a response in regard to an article I wrote regarding these bags and I'm pleased at the interest and the opportunity to discuss an important issue that apparently a lot of folks don't understand: the difference between photodegradation and biodegradation. Although the end results often look the same, the two processes are entirely different and have entirely different requirements. Some folks have written they don't think that a plastic bag lasts 500 years in landfill when the truth actually is that 500 years is a conservative estimate for their duration in a landfill. Some scientists postulate they don't ever break down. "I have plastic bags in my yard that are brittle and fall apart within two years." Yes I don't argue with this comment made by one of my readers. If any of you have ever joined our twice a year Trash Bash sponsored by Keep Garland Beautiful, then you too know this is a fact when you reach to pick up a plastic bag and it crumbles in your hand. These bags that we see falling apart outdoors have not biodegraded. They have photodegraded and that is an important distinction to understand if you care about the environment and future generations. Photodegradation is the alteration of a molecule by photons, particularly those wavelengths found in sunlight. However, even artificial light will induce photodegradation, which is why we are asked not take flash pictures of artifacts in a museum. Over time the light from these flashes will photodegrade the artifact. Oxidation is another process associated with photodegradation. Simply put, oxidation is the reaction of a substance with oxygen. This also explains why we sometimes see precious artifacts under glass in museums—to prevent their exposure to the air. Biodegradable simply means to be consumed by microorganisms and to return to compounds found in nature. Compostable materials are those that break down in a compost pile. Organic material can be aerobically with oxygen (which is typical of most compost piles in people’s yards) or anaerobically without oxygen (a process that typically requires more sophisticated equipment). According to the National Solid Wastes Management Association, modern landfills are not designed to break down waste. They are designed to store it forever. In a modern landfill tightly packed mounds of waster are sealed under a rubber and clay barrier, and over a liner that keeps the liquids from leaking out. But garbage in a landfill over generations of people does decompose anaerobically in this sealed, oxygen-free environment. However, because of the lack of oxygen, bacteria in the waste produce methane gas, which is highly flammable and dangerous if allowed to collect underground. It is also a potent greenhouse gas and contributes to global warming. Some landfills vent this gas into our atmosphere and other landfills are designed to capture it and use the gas as an energy source. 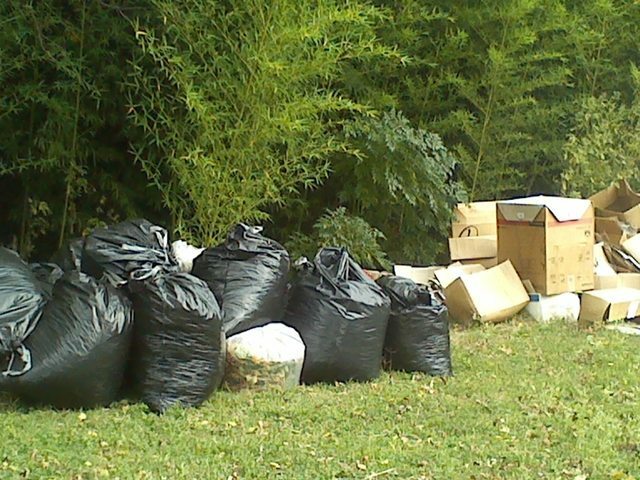 Most of the leaf bags we set out on our curbs in Garland go to the landfill. Also all of the tons of spoiled vegetable produce from all the grocery stores in Garland goes straight to the landfill—literally tons of organic waste every week filling up our landfill. This organic waste could be used as the basic material to create a business that could generate income for residents and provide compost for local gardeners—thus helping to lift up our local economy. What can you do about it? Perhaps more than you may think. If bothers you that we are literally throwing our money away by burying it in a landfill, please attend the Volunteer Conference on Tuesday, January 27 from 6 to 8pm at the Granville Arts Center Atrium and sign up to be the project leader for a team that Loving Garland Green is organizing with the assistance of some City officials to study the possibility of a composting service here in Garland, Texas. Perhaps We Need to Rethink Our Criteria of "Beautiful"
Is it more “beautiful” to see plastic bags filled with leaves waiting in a garden to be used for soil than it is to have them taken to a landfill and hidden from sight forever? These plastic bags, many of them as tough as 8 mil plastic, make fairly good compost bins if they are loosely packed. Just put a little water in them and shake them around. I graduated from the Seedling Planters School of Hard Knocks—Class of 2014. This year I’m growing at least 25 Brandywine Heirloom Seedlings as well as 175 other vegetable seedlings for the April Loving Garland Green Plant Sale. While some are still mooning over the seed catalogs, others of us already have our seeds in hand. We are eager to launch those specks of hope into seedlings to transplant in our gardens or even to sell. And no wonder! A well-kept secret is that people can make money by selling seedlings. If, for example, you were to grow 1,000 seedlings (not that difficult she says) and sold them for $2 each at a seed yard sale on your front lawn-- well, what fool wouldn’t purchase a plant for $2 that would cost them $4 to $5 down the street at a chain store? When should you start seedlings? How big do you want your plants to be when transplanted? If you start seed 5 to 8 weeks before transplanting to the garden, your seedlings can grow in seed flats and will be about 10 inches tall at transplanting time. If you start 8 to 12 weeks early, then plan to grow them in pots up to 12 inches diameter. Transplanting time for setting tomatoes out in the garden in North Central Texas is between March 20 and April 30 according to our Texas AgriLife Extension Service. I was always told by my grandparents to plant after Easter. Easter for 2015 falls on April 5. 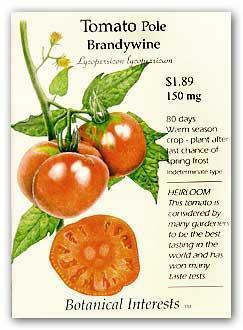 I will be planting my tomatoes sometime after that date and before April 15. This article presents a few tips for beginners (which I was last year so these disappointments are still fresh in my mind). Nearly all my seedlings sprouted, but soon withered and died. Now, after a little more education, I figured out what I did wrong. I used the best organic soil I could find to plant them in. #1 TIP: ONLY USE A SEED START SOIL MIX THAT HAS BEEN PREPARED FOR THAT PURPOSE AND THAT HAS BEEN STERILIZED. Gardening or potting soil contains organisms that will love to feed on seeds—especially your juicy tomato seeds. There are all kinds of commercial seed mixes on the market to choose from. However, if you don’t like to use the commercial stuff, and are willing to do a little more work, you can make your own sterile mix for planting your seeds. 1) Fill a cake pan with rich compost that I’ve screened. 2) Fill a pot with about half inch of water. 3) Put the cake pan in the water. 4) Cover the pot with a lid. 5) Bring to a boil and then turn down the heat and simmer for 30 minutes. The heat and steam will kill the organisms. After it’s cooled, I’ll mix a little pearlite into the soil. There will be enough nutrients to last about 3 weeks after germination as is with most seed start mixes. After that, as needed, I’ll apply some weakened alpaca manure tea (one cup to five gallons). #2 TIP: DON’T USE THOSE JIFFY POTS! They are the worst excuse for a plant pot. When planted in your garden, most of them don’t break down fast enough to allow the roots of the plant to escape. Furthermore these pots dry out at a much faster rate than the typical plastic growing pot. If you are more or less a casual gardener as I am, your seedlings may die of thirst before they even make it to the garden. If you insist on using them and can keep your seedling alive long enough for it to make it to the garden, then do the plant a favor by removing it from the pot before planting it. The ironic thing about these pots is the more expensive they are (the ones that contain coconut and coir fiber) the more indestructible they are. I don’t know what the half-life of coconut and coir fiber is, but it may be longer than that of the radioisotopes in a nuclear reactor. It is a good idea to keep seedlings covered until the seeds germinate. It’s also a good idea to keep them in a room that is about 72 degrees F. You can buy one of those start heat mats. I might use a heating pad that I already have. Caution: This is an experiment. I plan to cover the heating pad with a heavy towel and then a sheet of vinyl over that to insure the heating pad does not get wet. I’ll check often when on to ensure it is not making things too hot for the seedlings. Some folks go so far as to purchase grow lights. I can’t afford that so I’m making a clear plastic tent over one of my raised beds that I’ll bring the seedlings out to when the weather is at least 50 degrees F and sunny. Then I’ll take them back into the house for the night. Of course, if you have it, spend it and help to grow the local economy for the rest of us. But if you are pinching pennies, drive around the more affluent neighborhoods in Garland. On just about any given Monday or Tuesday you will be sure to find some pots curbside that someone has thrown away. In November of last year, I got over 300 seedling pots –all in trays too—at one home. They are perfect. I will use them to plant the seedlings I hope to grow with success this year for Loving Garland Green’s first seedling sale ever in April down at the Garden. About three weeks after germination, you will need to feed your seedlings. If you used a commercial mix, it may have enough extra nutrients to take a tomato plant to the four-leaf stage. Other mixes do not contain any extra nutrients. You can tell by looking at your seedling if it needs to be fed. If needed, you can water your seedlings with one level teaspoon of a liquid mix of 15-30-15 fertilizer in a gallon of water. Or you can make alpaca manure tea (one cup in a sock steeped in a five gallon bucket for 3 days). Once a week feeding should be more than enough. 4) Place seed on towel. 6) Put in Ziploc bag. 7) Put in warm place and continue to check every two days until germinated and then plant in seed mix. Tuesday was a great day for shoveling alpaca manure. 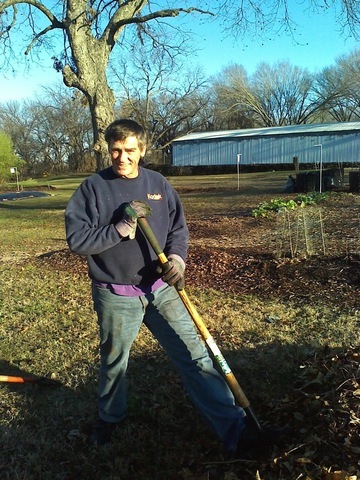 Tuesday, one of the best days according to weather predictions for the week, four members of Loving Garland Green spent the afternoon in the beautiful sunshine shoveling alpaca manure for the Garland Community Garden. We had fun. Generally speaking, alpaca manure is expensive. For example, Island Alpaca Company located in Martha's Vineyard, sells it for $11.95 for two pound bags. Of course their product comes in a burlap bag with a block figure of black alpaca on it and you don't have to go out into the pasture and shovel your own into a fifty-pound bag that once held chicken feed. I guess there is something to be said for presentation. 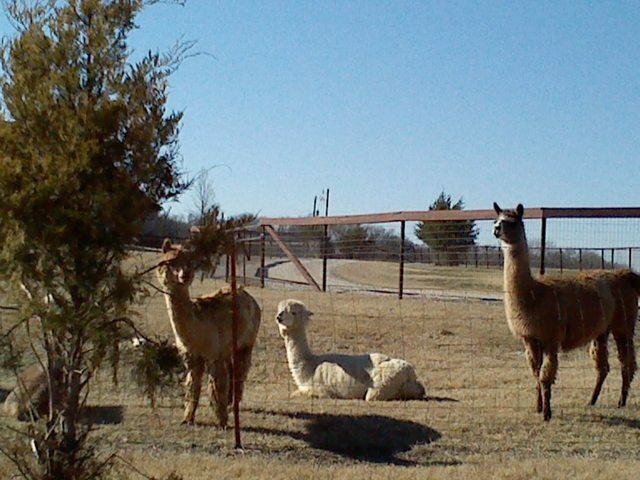 At the farm where we gathered our Alpaca manure, we paid $4.50 per 50-pound bag we filled. 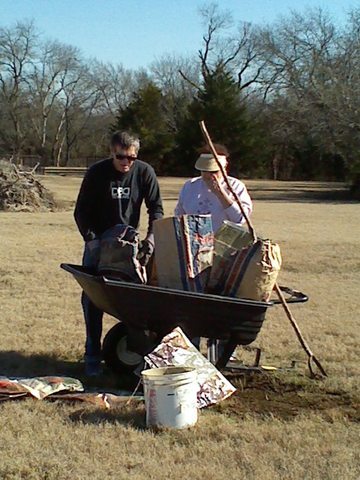 In approximately three hours, the four of us shoveled and bagged 19 fifty-pound bags. At the Martha's Vineyard rate, each one of our bags would have cost us $298.75. For the entire load we shoveled, we would have paid $5,676.25. Alpaca manure, like rabbit manure, has many benefits for the garden. First of all, these manures can be cold-composted. This means they can be put directly into the garden bed without danger of burning the plants or introducing any harmful pathogens into the soil. You don't have to compost them first. Just put them on top of the garden soil and water. These types of manures also break down rather quickly and are an excellent source of nutrients for plants. Members of Loving Garland Green will put some of the pellets in a sock, stick the sock in a five-gallon bucket, soak it for about 48 hours, and make alpaca tea to feed to our seedlings--much cheaper than Miracle and we won't have to worry about burning the tender seedlings which we hope to sell at our April Seedling sale event down at the Garden and at the Garden Market place. We will bag some of this up and sell it at the Garland Marketplace in April at a profit to raise money for Loving Garland Green's operations. We will also be selling rabbit manure as well along with our seedlings. Woven into our mission as an organization is the goal to lift up our local economy by showing our residents that a plant-based economy offers almost unlimited opportunities for making money--and often with close to zero investment. 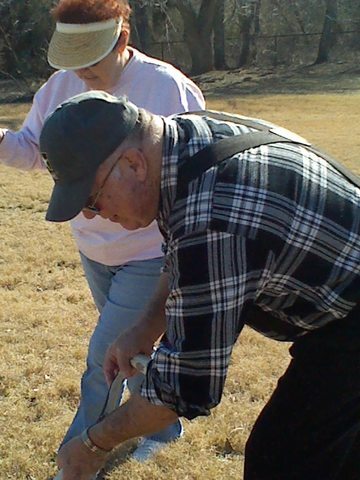 Loving Garland Green Members, Kevin Keeling and Margie Rodgers in the pasture. Kevin is project leader for two of our garden projects this spring: Seedlings for Sale and our Three Sisters garden plot build. Margie, one of our board members, is the project leader for building a spiral herb garden down at the community garden. Loving Garland Green Members, Gene and Margie Rodgers. Gene is leading two of our water conservation projects: rainwater harvesting and rainwater monitoring in the garden. Loving Garland Green is moving into 2015 with many projects on our map for this year, and many more to come. We are inviting Garland residents to join us in making this unique community garden the success it deserves to be. Our community garden is not like the typical community garden where residents sign up for a small garden plot and pay $40 to $70 a year to raise a garden there. The Garland Community Garden offers a much broader range for community participation than the average community garden. These opportunities are available through Loving Garland Green who are the official stewards of this garden. We do offer garden plots (4 x 8 feet) to any Garland resident who wishes to maintain that plot by growing edibles. We do not charge fees for this, but the resident does have to volunteer one hour a week to do other maintenance work in the garden or to work on one of the many garden-related projects. Many of the various plots in our garden are designed to be managed as projects demonstrating various gardening techniques and formats. We have many of these projects for 2015 already defined and waiting for project leaders. Among these exciting projects waiting for a project manager is the City-Approved Free Compost PickUP Service for a Garland grocery store. (City-Approved means the mayor backs this project and it is within the guidelines of the Garland Health Department.) This will be a high-visibility project for the grocery store, the project leader and team, and for our community. It is a pilot project designed as a proof of concept for possible broader application in our City. Details, including the selection of the grocery store and the project leader are to be decided. The team appointed for this project will pick up spoiled produce from the grocery store on a regular basis, yet to be defined. This produce will be taken to the Garland Community Garden and properly stored in covered bins. This produce will be used in a method called "trench composting" in the beds down at the garden. We have wire feeding baskets already inserted in some beds for this purpose and we also will dig a twelve-inch deep five inch wide trench the length of the beds in the Winding Garden. Spoiled produce will be put into the trench and covered with dirt. Other produce will be put in composting bins at the garden, and the rest of the produce will be available for Garland residents to pick up from their gardens. The team in charge of this project will keep records on this project that they will then share with City leaders at the end of six weeks. These records will include such data as total pounds of produce collected, time, number of pickups of produce at the Garden from Garland residents, etc. Note: This project has particular importance for a number of reasons. Currently more than 150 American cities offer curbside municipal compost pickup, but some places are taking the initiative even further by mandating composting. Of the millions of tons that we waste in America each year, the U.S. Environmental Protection Agency (EPA) estimates 96% ends up in landfills. And currently, food waste is the number one material taking up landfill space, more than paper or plastic. Since it looks highly likely that mandated composting will be part of our future, we may as well get ahead of the 8ball. Perhaps information from this pilot study could be used to help establish a cooperative here in Garland to pick up the spoiled produce curbside and take it to a processing site where it is turned into garden compost sold to local gardeners in the region? We need more cooperatives in Garland to help stabilize our local economy. Elizabeth Berry, President of Loving Garland Green, will present a brief summary of Loving Garland Green's programs and projects currently planned for 2015. If you decide at the meeting that you want to be the project leader for a particular project, you will need to join Loving Garland Green and sign our liability agreement. We already have project leader packets available for you to help you get started. There will also be information for your review after the regular meeting. Most of this information is available on our website homepage at www.lovinggarlandgreen.org. Loving Garland Green will be represented at the 2015 Board, Leadership, and Volunteer Fair is an opportunity for Garland residents to meet and be recruited by the non-profits, neighborhood groups, civic organizations, and City committees that serve our community. Representatives of more than 30 organizations will be on-hand to meet and recruit potential board candidates and volunteers. Yesterday in working on Loving Garland Green's program and project definitions for 2015, I came across Renee's Garden Seeds in my quest for more information regarding the Three Sisters Garden, a project we will put in place as soon as the nights are consistently 50 degrees F and above. Renee's company has signed the Safe Seed Pledge developed by the Council for Responsible Genetics. They do not sell chemically treated or genetically engineered seeds. 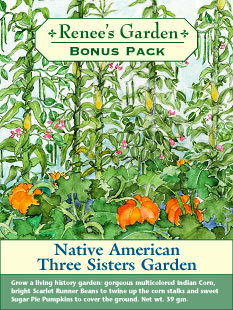 I ordered two packets of these seeds from her last night--one for the garden and one for a friend. I happened to notice that Renee is located in Felton, California (Santa Cruz County). Hmmmm that name sounded so familiar to me. Then this morning I remembered why. Back in 2010 I was doing some research on how well privatization does and does not work for communities, I came across the story of Felton's experience when their water utility was privatized. I wrote an article on the story. Privatization of Water Utilities for Felton California and the Ensuing Story of Community Resilience. Speaking of privatizing water, the citizens of Felton California learned how bad that was for their community: A classic example of how privatization schemes don’t always work for ordinary citizens is exemplified by what happened to the people of Felton California when their water supply was privatized. In 2002, when Citizen Utilities, the small company that ran the water system for Felton, California was acquired by American Water Works Co. Its subsidiary, California-American Water (Cal-Am), took over Felton’s water utility. American Water was acquired shortly afterward by London-based Thames Water. Now that's "globalization"--an insane situation that allows people in London to control the water of citizens in California. What do you think these people in London even know or care about water in California or the people who live in Felton? In November 2002, Cal-Am proposed a 74 percent rate increase over three years, subject to approval by the California Public Utilities Commission. Felton residents formed Friends of Locally Owned Water (FLOW), and with legal help from Santa Cruz County, fought the rate increase, which the utilities commission knocked down to 44 percent. But the threat of escalating costs loomed, so FLOW began working on a plan to buy the water system and turn it over to the nearby San Lorenzo Valley Water District (SLVWD), a public utility. Their efforts were successful, and the ballot initiative won with nearly 75 percent of the vote. SLVWD then proposed to buy the water system for $7.6 million, but Cal-Am/RWE refused to sell. So SLVWD pursued eminent domain to force a buyout. Just before the case was to go to jury trial, the company settled with SLVWD. Today, with Felton’s water back in the hands of a public utility, the average resident’s bill has dropped by at least 50 percent. FLOW has calculated that even with the tax increase, most residents are already saving as much as $400 per year. Most people don't realize the importance of a community pulling together until after some disastrous event, but there is a lot to be said for developing community resilience before you need it. Gardens Grow Economic Roots and Stabilize Communities: One of the best ways to promote community resilience is by encouraging people to grow at least some of the food they eat. When people begin to grow gardens, they begin to grow and stabilize their local economy as well. First of all, gardens begin by stimulating the existing local markets. People go to the local hardware and garden stores to purchase seeds, soil, plants, garden tools, etc. But after a time, some of these more enterprising gardeners start thinking outside the fences of their own gardens. One example in our own community of Garland Texas is Melyssa Childs-Wiley, owner of Fat Lady Foods who makes delicious jams. Melyssa purchases the goods she uses to make her jams (that she doesn't grow herself) from local folks. As for the commercial kitchen to prepare her jams, she uses the services of a nearby commercial kitchen. Community vegetable gardens such as the Garland Community Garden at 4022 Naaman School Road here in Garland are especially beneficial in speeding up the process of developing community resilience--especially when they are managed in such a way as to demonstrate various gardening techniques to the public. Many possibilities for a community are offered through gardens. I especially look forward to seeing many of these possibilities become realities here in Garland in 2015. We have many projects on our map for implementation this year, and many more to come. I hope that you will join us this year and volunteer to be a project leader. It's easy: no membership fee. Just show up at 216 East Kingsbridge Drive Garland Texas 75040 and you will immediately be welcomed and put to work. We meet every Monday from 6:30 PM to 7:30 PM. Who knows where your first step might lead? Perhaps in a few years you might establish a seed company here in Garland like Renee's. Perhaps you might become one of the founding members of a compost cooperative. It's up to you.